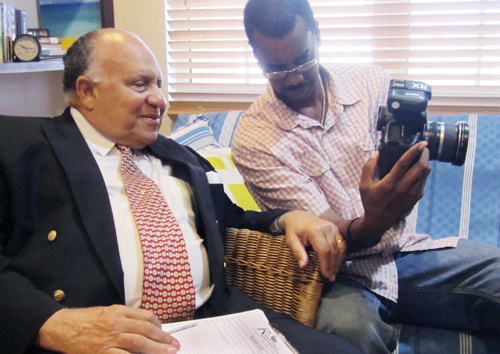 Photographer Vado Culmer captured a portrait of the distinguished Dr. David Allen for the Bahamian Project. The photo session took place at Dr. Allen’s office in Sandyport, both inside and outside, with the Sandyport bridge in the background. Dr. David F. Allen trained in Medicine at Saint Andrew’s University in Scotland, UK, and in Psychiatry and Public Health at Harvard University in Boston, USA. He is certified by the American Board of Psychiatry with Added Qualification in Addiction. He has taught at Harvard and Yale, and held a clinical professorship in Psychiatry at Georgetown Medical School in Washington, DC. In 1987 he was awarded the Bennett Commonwealth Prize for his outstanding work in cocaine addiction. He was featured in the P.B.S. special, The Drug Wars, which documented his discovery of crack cocaine and its epidemic in 1985. A pioneer in the development of treatment approaches to cocaine addiction in the Bahamas and Washington, DC., Dr. Allen is a recognized expert in all types of addictions and their causes. He has published widely in the areas of Addiction, Spirituality and Psychiatry and is a well-known public speaker. In 2008, Dr. Allen founded The Family: People Helping People program, based on his own Contemplative Discovery Pathway Theory. The program offers individual and group counseling and now comprises over twenty groups throughout New Providence. The Family addresses issues such as anger, loss, grief and the roots of violent crime and addiction. Dr. Allen’s current work in the area of resocialization seeks to tackle long term effects of social fragmentation which occurred when the Bahamian cocaine epidemic became feminized, uprooting the foundation of a historically matriarchal culture. He also founded The Renascence Institute International in Nassau, a private practice offering full psychiatric and psychological services. Dr. Allen serves as Consultant to several Bahamas Government Ministries and National Agencies and has written numerous books and scientific papers and is considered a leading international expert on the psychology of shame. He has a regular radio program on Sunday evenings at 7:00 pm on FM 97.5, Coming Home to The Heart. He also hosts a television program, People Helping People, on Wednesday evenings at 9:00 pm on the Jones Communication Network. Bahamians owe so much to this man! I am on top of the list! Selah!